Today’s women seem more passionate about business that ever before. In the sixties we fought for equal rights in the workplace, in the seventies we fought for equal pay, in the eighties we put the first American woman in space and we begun our fight against sexual harassment. In the nineties women served in combat for the first time, during the Gulf War. Today we are twenty first century women and there is little difference between a man or a women in business. Or is there? Recently I read this statement: “Successful women entrepreneurs do not look at their peers and subordinates as men or women, but just as people whom they must lead or interact with in the course of their work.” I must say that I totally disagree with this statement and believe that a woman who understands the different between men and women will get more out of their professional life than those that deny that there are in fact differences. Taget Women offer a glance at the physiological variations in the brains of men and women which can be beneficial. Male brains are 10% larger than female brains. Female has more nerve cells in certain areas. Women transfer data faster due to larger corpus collusum, making it easier for increased flexibility and multitasking. Men are left-brain oriented and are largely successful in solving numbers and problems. 'Gray matter' - the part that allows thinking is 55.4% in women and 50.8% in men. This reveals that women are endowed with natural advantages that aid in creating, developing and fostering relationships. Not restricting herself to merely fostering relationships with her family, friends and society, a successful woman uses this proficiency to build and maintain a flourishing business enterprise. She translates her natural advantages into effective networking, excellent communication skills and empathetic behaviour. Her mastery over multi-tasking influences her to initiate action with direction and integrate it with management and organizational skills. A successful woman entrepreneur has the attitude and the inner drive to change her dream, her vision into reality. 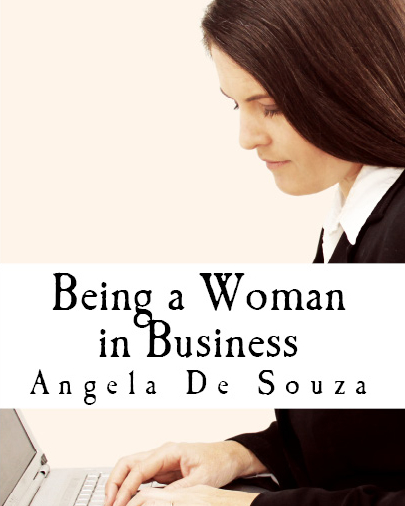 I invite you to join me on a journey of discovering the truth about what it means to be a woman in business. As Christian women we don’t want to fight to be like a man, we simply want to be the women that God designed us to be. Being a Woman in Business will explore dynamic business principles that can be applied no matter what your gender but we will also explore how we can become successful business women. This means that we will not lose our identity or femininity just because we are driven, capable individuals. This also means that we will explore how to treat our male colleagues in a way that will get us ahead of the women that constantly fighting the men for equal rights. Watch this space as you witness a new breed of women in business rise up to take their place. Will you be one of them?